The No. 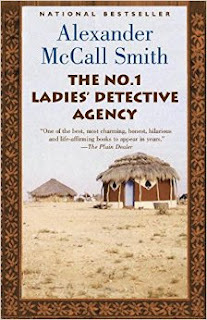 1 Ladies' Detective Agency Stories by Alexander McCall Smith describe the adventures of Precious Romatswe and her assistant Grace Makutsi as they solve mysteries, improve people's lives, and navigate the hazards of being a "modern lady" in a traditional society. The thing I like about this series is that Alexander McCall Smith has spent a great deal of time in Botswana, and as a result, he paints a wonderful portrait of its people, landscape, and culture. Precious and her friends are decent, gentle people, with a deep connection to their country and what it stands for. The people the Agency investigates often don't have good character, but Precious gives people the benefit of the doubt in a way few people can. I love that about her, and her trusting nature is balanced by Grace's more acerbic world-view. I've tried other series by AMS, but none engaged me in the stories of the characters' lives like these.